HOLIDAY THEMED RACING AND MORE AT VERDUGO PARK IN GLENDALE! Venue: Verdugo Park Location: 1621 Cañada Blvd. 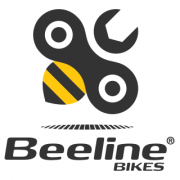 Enjoy Verdugo Park for the longest standing (9th year) classic SoCalCross event hosted by The TEAM SoCalCross, Pasadena Athletic Association and Montrose Bike Shop! 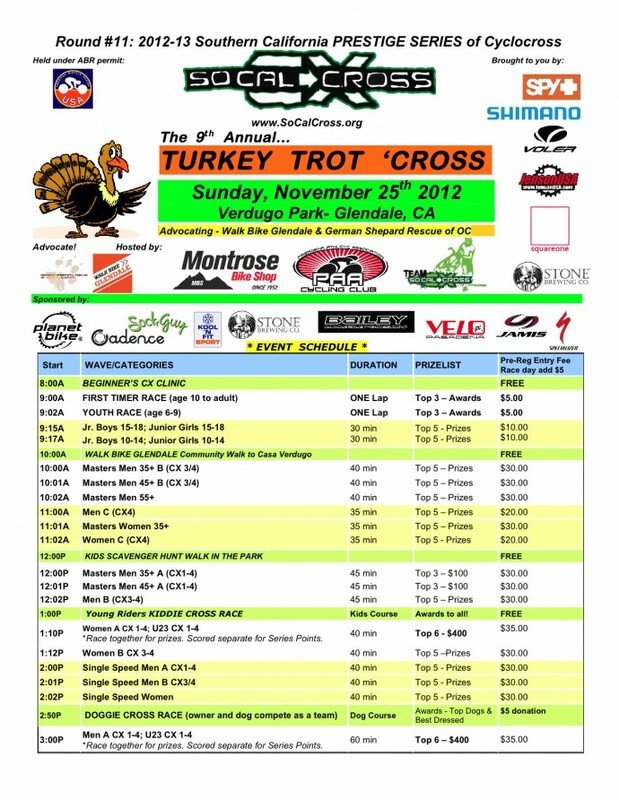 SoCalCross PRESTIGE SERIES action starting off at 9am! Morning Waffles afternoon Turkey Dogs! 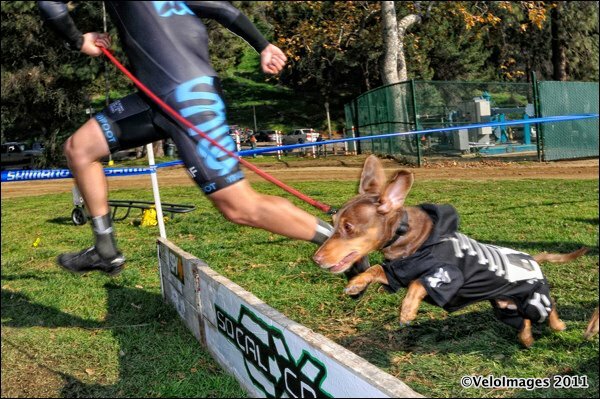 The debut of Doggie Cross 2012…. benefiting German Shepard Resue of Orange County! Kids Bike Rodeo hosted by Walk Bike Glendale & Young Riders! Kids Walk-Scavanger Hunt to follow the kids race hosted by The TEAM SoCalCross! Donation Drive …. Clothing-Yark Sale items… bring your unwanted-un-used stuff you’d like to donate to our advocacy partners in our theme of GIVING! How about a Walk? Well, Walk Bike Glendale will host a Community Walk! Meet at 10am at the Park. THE VENUE: Verdugo Park is one of the crown jewels in the City of Glendale park system. Though it is in the middle of a residential neighborhood it features ample grass, mature shade trees, a sparkling creek, great picnic areas, and a skate park! 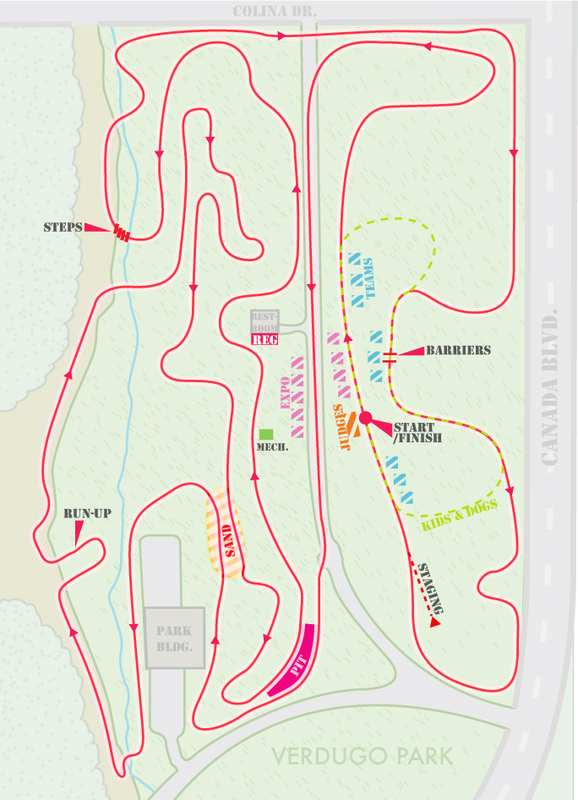 THE COURSE: Race takes place in a beautiful urban park shaded by trees. Start/finish will be on east lawn. Course is a mix of pavement, dirt and grass. The championship-proven course is mostly flat with a challenging downhill U-turn then run up, twisting through mulch, a fast approach stairs section, fast approach double barriers, and through the infamous Tot Park Sand Trap©! Each lap is approx. 3.5km in length. 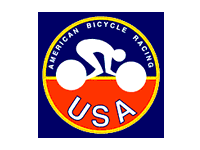 Races are timed circuits on the course based on race wave. REGISTRATION: Online registration is available via AthletePath.com and can be found at: www.socalcross.org/register Online registration closes Thursday November 22nd at 11:59PM (Pacific). Race Day registration opens at 7:30AM and then 2 hours prior to race category start and closes 20 minutes prior to race category start. CYCLOCROSS RACING AGE: A rider’s racing age for the 2012-13 Cyclocross Season is the ‘racing age’ they’ll be the year of the UCI CX World Championships which take place in January 2013. 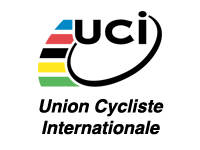 Your racing age for the entire cyclocross season running September 2012 through January 20123is your age as of 12/31/2013.